Abstract. Light-absorbing impurities (LAIs) decrease snow albedo, increasing the amount of solar energy absorbed by the snowpack. Its most intuitive and direct impact is to accelerate snowmelt. Enhanced energy absorption in snow also modifies snow metamorphism, which can indirectly drive further variations of snow albedo in the near-infrared part of the solar spectrum because of the evolution of the near-surface snow microstructure. New capabilities have been implemented in the detailed snowpack model SURFEX/ISBA-Crocus (referred to as Crocus) to account for impurities' deposition and evolution within the snowpack and their direct and indirect impacts. Once deposited, the model computes impurities' mass evolution until snow melts out, accounting for scavenging by meltwater. Taking advantage of the recent inclusion of the spectral radiative transfer model TARTES (Two-stream Analytical Radiative TransfEr in Snow model) in Crocus, the model explicitly represents the radiative impacts of light-absorbing impurities in snow. The model was evaluated at the Col de Porte experimental site (French Alps) during the 2013–2014 snow season against in situ standard snow measurements and spectral albedo measurements. In situ meteorological measurements were used to drive the snowpack model, except for aerosol deposition fluxes. 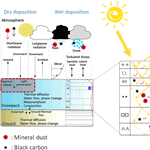 Black carbon (BC) and dust deposition fluxes used to drive the model were extracted from simulations of the atmospheric model ALADIN-Climate. The model simulates snowpack evolution reasonably, providing similar performances to our reference Crocus version in terms of snow depth, snow water equivalent (SWE), near-surface specific surface area (SSA) and shortwave albedo. Since the reference empirical albedo scheme was calibrated at the Col de Porte, improvements were not expected to be significant in this study. We show that the deposition fluxes from the ALADIN-Climate model provide a reasonable estimate of the amount of light-absorbing impurities deposited on the snowpack except for extreme deposition events which are greatly underestimated. For this particular season, the simulated melt-out date advances by 6 to 9 days due to the presence of light-absorbing impurities. 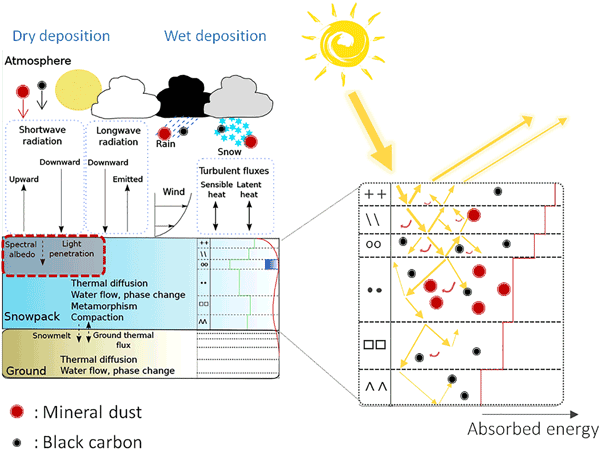 The model makes it possible to apportion the relative importance of direct and indirect impacts of light-absorbing impurities on energy absorption in snow. For the snow season considered, the direct impact in the visible part of the solar spectrum accounts for 85% of the total impact, while the indirect impact related to accelerated snow metamorphism decreasing near-surface specific surface area and thus decreasing near-infrared albedo accounts for 15% of the total impact. Our model results demonstrate that these relative proportions vary with time during the season, with potentially significant impacts for snowmelt and avalanche prediction. How to cite: Tuzet, F., Dumont, M., Lafaysse, M., Picard, G., Arnaud, L., Voisin, D., Lejeune, Y., Charrois, L., Nabat, P., and Morin, S.: A multilayer physically based snowpack model simulating direct and indirect radiative impacts of light-absorbing impurities in snow, The Cryosphere, 11, 2633-2653, https://doi.org/10.5194/tc-11-2633-2017, 2017.